Team Aqua has won the RC44 Sweden Cup for the second year in a row with a race to spare, on a day where the wind increased and the sea state made for some exciting downwind sleigh rides in Marstrand. It was tight going into the final day of racing at the RC44 Sweden Cup with only 10-points separating the top four boats. Second placed Katusha (RUS) came out fighting, taking control of the first race of the day. They led Artemis Racing at the windward mark with Team Aqua (GBR) back in sixth place, but an early gybe by the British team saw them surf into third by the leeward gate. The positions didn’t change to the finish with Katusha taking the win from Artemis Racing and Team Aqua in third. 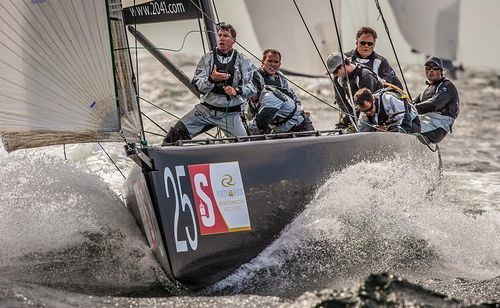 Race two got underway as the breeze steadily increased with gusts over 20 knots. The leaders all opted for the left hand side on the first beat, but the right paid off and it was the Russian pair, Team Nika and Synergy, who led at the windward mark. 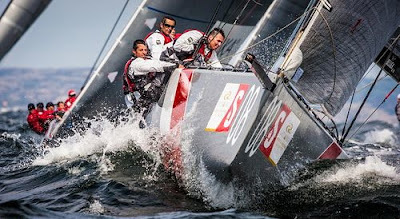 Aqua rounded sixth with Artemis Racing eighth and Katusha tenth. RUS 7 had been one of the leading boats before their mast came crashing down, snapping 1.5 metres above the gooseneck. Downwind there was plenty of drama with Peninsula Petroleum broaching and AFX Capital struggling to control their kite drop at the bottom gate. But Team Aqua were relishing the conditions and on the first run they took four places to round second. On the final run Aqua kept the pressure on Team Nika and Chris Bake’s men surfed across the finish line to take the gun. 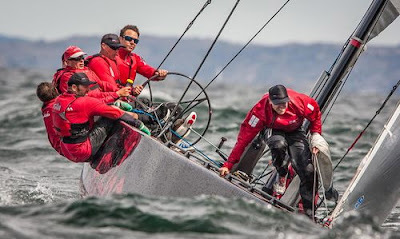 Katusha and Artemis Racing moved up the rankings to finish fifth and sixth respectively, but Team Aqua had sealed the event with a race to spare. 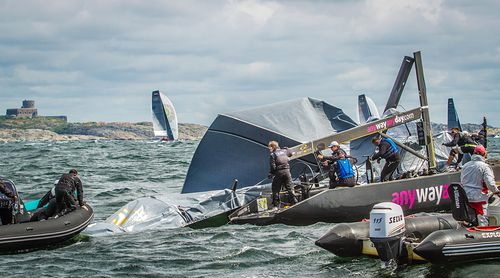 After racing Team Aqua’s tactician, Cameron Appleton, disclosed the team had snuck in three extra days of practice ahead of the event in Sweden where it had blown 30 knots everyday. Their extra time on the water showed through their excellent boat handling. “It was awesome today, unbelievable. The boat was going like a bat out of hell. It was really hard. The upwind felt like three rounds with a sumo wrestler – trying to hold on to the wheel getting knocked around all over the place – it was hard work but a lot of fun,” Bake said. The race was now on for second. 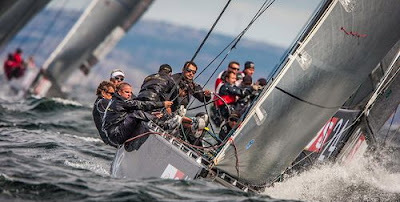 Artemis Racing was tied for points with Katusha and whoever beat the other in the final race would take second as long as they were no more than six places behind Hugues Lepic at the helm of Aleph Sailing Team. Team Aqua asserted their dominance by leading the race from start to finish. Behind them places were changing. Half way up the first beat Katusha tacked right on Artemis Racing forcing the Swedish team to tack away. 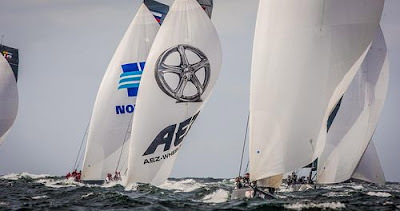 By the top mark Aleph was second, Katusha fourth and Artemis Racing back in ninth. 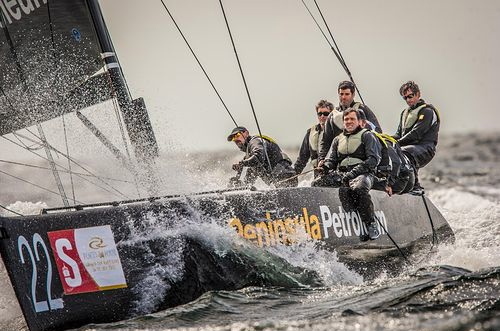 After another dramatic run that saw Peninsula Petroleum’s kite explode, Aleph had dropped to third, Artemis Racing gaining one place to eighth. 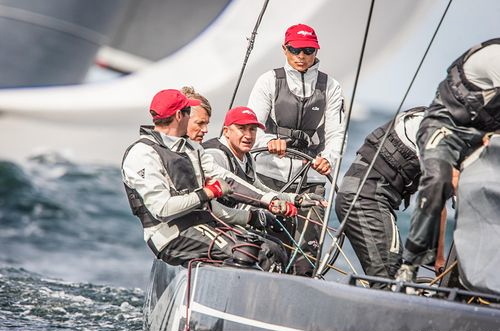 By the final gun, Steve Howe at the helm of Katusha with Andy Horton calling the shots had done enough to take second overall, just one-point ahead of Artemis Racing, who were in turn one-point ahead of Aleph. The French team just missing out on the podium. Although disappointed not to have won on home waters, Artemis Racings’ owner Torbjorn Tornqvist still enjoyed another great day of racing in Marstrand. “It was fantastic out there; huge waves, big winds and we had some great moments of speed, clocking 23 knots at one point with the water flushing over us. It was fantastic,” he said. As for the overall RC44 Championship Tour each of the teams can now discard their worst event of the season. Team Aqua lose their fourth and count two firsts and a second. Artemis Racing are the only boat that can stop Chris Bake’s team being crowned RC44 Tour Champions for the second year in a row. 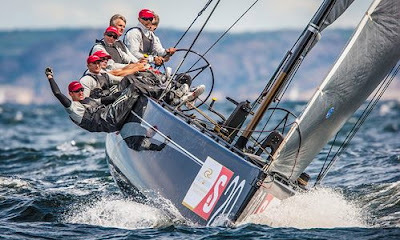 The Swedish team need to win the Adris RC44 World Championship in two months’ time, with Aqua counting a fourth or worse to stand a chance of taking the Championship. The final event of the season, which doubles as the classes World Championship, will take place in the beautiful fishing town of Rovinj, Croatia from 3rd-7th October. Sailor Helmets - What's Your Number?